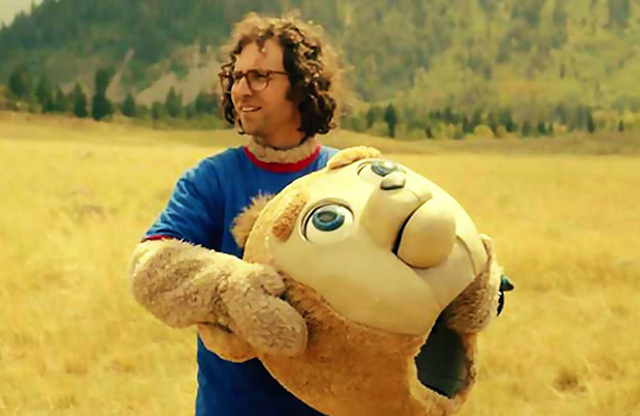 “Brigsby Bear” is a sweet movie, and “Saturday Night Live” cast member Kyle Mooney is perfect as that man-boy named James, who was kidnapped as a child and forced to live in underground shelter, because his captors Ted and April (Mark Hamill and Jane Adams) tell him the air is too poisonous to breathe. The only TV programming they give him to watch is “Brigsby Bear,” and that is produced in secret by his fake father Ted. James grows to early manhood, and a raid on the shelter puts him back into the real world, and his real parents (Matt Walsh and Michaela Watkins). Trying to make the transition back, James misses one key thing… Brigsby Bear. 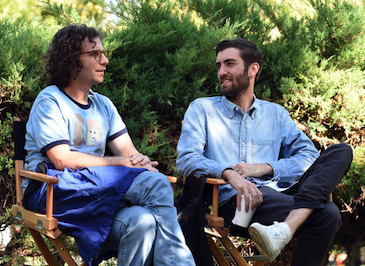 Lead actor Kyle Mooney and director Dave McCary of “Brigsby Bear” are practically lifelong friends. They both hail from San Diego, and they attended the University of Southern California together. After graduation, they formed the comedy group Good Neighbor with future SNL performer Beck Bennett and Nick Rutherford. SNL hired all of the Good Neighbor troupe in 2013, with McCary and Rutherford taking behind-the-scenes roles. HollywoodChicago.com contributors Patrick McDonald and Jon Lennon Espino interviewed Mooney and McCary during a recent promotion tour of Chicago, and the interview is divided into transcript and audio clips. HollywoodChicago.com (Patrick): You did an extraordinary job in your story keeping both the Brigsby TV Show and your character of James as warm and emotional. What was most difficult about that emotional flow in both writing and performing the story? Kyle Mooney: I was very fortunate to have Dave directing, who I grew up with, and from the onset we wanted to push the honesty and earnestness angle, to get to the heart of what the film was about. I did my best to play the character of James as we had written it… I didn’t try to push anything too hard. We felt pretty good about the writing, and if we could get on film what we wrote, we’d do the story justice. Dave McCary: Unlike the SNL experience and all of our internet videos we did before SNL, where we’re constantly trying to ‘punch up’ a moment for laughs, we never felt that pressure scene-by-scene in ‘Brigsby’… because if we leaned into comedy constantly we’d lose the emotional journey. Life isn’t like sketch comedy, where everyone has a zinger every five minutes. HollywoodChicago.com (Jon): Dave, as a director you were trying to replicate some of the children’s TV shows from the 1980s. Was there a particular aesthetic you were trying to reference? McCary: We went through so many references. One of the main ones was a live action Teddy Ruxpin special. That was one of the few templates that gave us that world, the electronic look and the pacing of the show. Mooney: ‘Welcome to Pooh Corner’ and ‘Dumbo’s Flying Circus,’ both live action specials from the early Disney Channel, were other points of reference. HollywoodChicago.com (Patrick): How did you create the particular video ‘look’ of those shows? Did you do it digitally? McCary: We purchased from Ebay four vintage broadcast cameras from that era, and built the other parts like the sets and the animatronics for the Bear. We wanted it to be as realistic and authentic, as if a guy was making his own homemade show. And once we locked all the TV show edits, we had a connection with Tim Heidecker and Eric Warheim’s production company, and their VHS guy did several transfers. We would also do a pass where we banged on the VCR, to get some video glitches. That type of stuff was the tedious part of the process, but when I look back on it that’s the real magic of filmmaking… that homemade look of digging deep into the making of that particular TV show. HollywoodChicago.com (Patrick): Dave, you went from segment director on SNL, and doing videos for YouTube into a full-blown director on a movie set. Where did you feel most comfortable, and what moments did you think ‘we’re not in Kansas, anymore’? McCary: Actually, going from internet videos to SNL was so much more jarring than going from SNL to the feature film, because the SNL sets are big and have larger crews than we had on this small independent movie. I never felt overwhelmed, if anything there was a sense of the relief because we had more time to be precious with all elements of production. On SNL, the turnaround for production is insane. The result on the actual show is often a rough cut that you’re showing the world. [laughs] For the film, it wasn’t that I wasn’t in ‘Kansas’ anymore, it was more like I was back in Kansas. HollywoodChicago.com (Jon): Since Mark Hamill was such a great choice to produce the fake TV show, because of his cartoon voiceover experience, was he always the first choice? Mooney: No, that role was really tough to cast. We knew the guy was strange, but also a genius, and had some darkness in his persona. And we also wanted somebody you wouldn’t immediately think of, who wouldn’t necessarily take on a role like this. And besides all of that, the guy had to do a weird high pitched voice on camera. HollywoodChicago.com (Patrick): Kyle, your character of James is a stranger in a strange land, once he is released from his captors. Was he intended to be a savior, like Jesus Christ, or was he just an innocent aura that brought out the innocence in all the people he encountered, which allowed them to flourish? Mooney: I never compared him to J.C., but I’d like to think the character touches people lives. It also defines how people are open to strangeness and someone who is an outsider. McCary: We see this a lot in cinema, where an outsider is not embraced immediately, and then eventually becomes embraced. It was fun for us to imagine the community where some people were attracted to James immediately, because of his crazy story, plus he was chill and interesting. In the audio portion of the interview, LIVE from a couple weeks ago, Kyle and Dave talk about Andy Samberg’s role in the film, the mythos of ‘Saturday Night Live’ – including the shock of realizing they’re in the same room with a person (Patrick) who saw the first episode on TV live in 1975 – and why the best stories from the SNL experience are the most unpublishable.